There’s nothing like unwinding from a busy week with free live music and a sunny afternoon picnic. Vail Jazz observed that such a scene was too good to reserve for only the first Friday of the month, which is why the all-new Vail Jazz@ Riverwalk was born, infusing The Riverwalk in Edwards with an outdoor party every other Friday all summer long. Vail Jazz @Riverwalk kicks off the summer weekends on a high note beginning at 5 p.m. June 9 with the romping, high-energy tunes of The Burroughs. The homegrown, northern Colorado-based nine-piece calls its sound “sweaty soul,” and fuses its self-proclaimed “powerhouse” rhythm section with a vibrant, four-piece horn section and unquestionably charismatic vocals delivered by front man Johnny Burroughs. The Burroughs return to the Riverwalk Backyard Amphitheater in Edwards, where they had the packed, picnic-toting crowd on its feet dancing for nearly their entire set last summer during Riverwalk First Fridays. Vail Jazz @ Riverwalk replaces Riverwalk First Fridays, bringing a sizzling variety of regional artists to Edwards every other Friday along with local food and drink vendors, including rotisserie barbecue from Revolution, paninis and salads from Eat! Drink! and cocktails from 10th Mountain Whiskey. Following its June 9 summer launch, Vail Jazz @ Riverwalk continues June 23 with New Orleans flavored Otone Brass Brand, rhythm and blues group Phil Wiggins and George Kilby Jr. on July 7, contemporary jazz saxophonist Nelson Rangell on July 21, the U.S. Air Force Academy Falconaires Big Band Aug. 4 and sizzling salsa 12-piece Quemando on Aug. 18. Not sure whether to leave the kids at home? Bring them along. Alpine Arts Center offers free arts and crafts for children and the general ambiance delivers entertainment for all ages. Vendors open at 5 p.m. and music begins at 6 p.m. Picnics are welcome but no pets are allowed and the event is non-smoking. 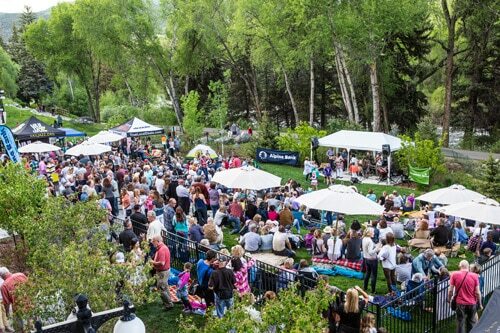 Reserve your summer Thursdays for bumpin’ live jazz Vail Jazz Festival delivering biggest summer lineup in history Lights on the ladies of jazz at the 19th Annual Vail Jazz Festival Vail Jazz Escalates to New Heights in 2015 Was Sinatra a jazz singer?